This gorgeous hat is ideal for beginners. You can whip it up in next to no time. 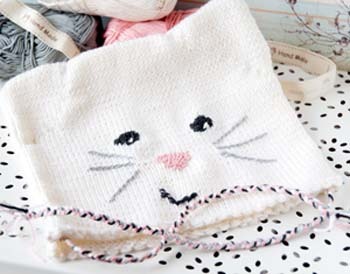 Knit a cute kitty hat for a toddler – or adjust the sizing and create one for a newborn baby or an older child. Cast on 44 sts (do more, or less, depending on the size you want). Row 3: p to end. Continue with St st (knit one row, purl one row) until the work measures 30cm (12 inches). End with a purl row. Cast off in St st. Fold over and stitch down the sides. Using 1 strand of white Persian wool, hand-sew a running stitch across each top corner to create ‘ears’. Using 2 strands of black Persian wool, stitch the shape of two eyes in stem filling stitch, which are simply rows of stem stitch. Use white Persian wool to create the whites of the eyes. 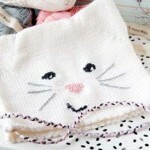 Using 2 strands of pink Persian wool, stitch the shape of a nose in stem filling stitch. Stitch whiskers and a mouth in stem stitch. Take 2 strands each of white, black, pink and grey and plait them to form ties. Make 2 ties, each approximately 30cm (12 inch) long. Hand-sew one tie to each side of the hat. This pattern featured in Sweet Living Magazine, Issue 8 – our free online magazine. Click through here for some more great projects from Issue 8. Great pattern. 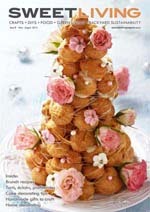 Thanks so much for sharing with Adorned From Above’s Link Party. Thanks Debi and Charly. We love your link parties!